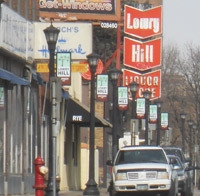 The South Hennepin Business Association is pleased announce the launch of our Lowry Hill District rebranding effort for Hennepin Avenue between Douglas Avenue and West 28th Street. The new Lowry Hill District identity signs started going up today and our new website, featuring a comprehensive directory of local businesses, went live today as well. This rebranding effort started with a large survey of businesses and property owners back in 2010 that made it clear that our area lacked a common identity. The rebranding process continued with a series of business and neighborhood group meetings in 2011 along with the planning and fabrication of the new permanent identity signs. The overarching goal of this rebranding effort is to help improve visibility and increase sales for local businesses by creating a unique identity for our segment of Hennepin Avenue. Think of the well-known business district identities in Minneapolis – Eat Street, Lyn-Lake, the Warehouse District – businesses in these areas benefit because the general public understands immediately where these areas are located. Our business survey also told us that business owners wanted help marketing and promoting themselves. The new LowryHillDistrict.com website is intended to serve as a springboard for local businesses to promote their products and services to the thousands of residents, workers and visitors in our area every day. The new identity signs and the website are just the start of our efforts to help attract more customers to the area. We are exploring a variety of strategies aimed at marketing and promoting local businesses. Plus, we have more website features we plan to roll out in the coming months. Formed in 1993, the South Hennepin Business Association is a nonprofit corporation of member businesses whose mission is to promote and support local business and property owners.